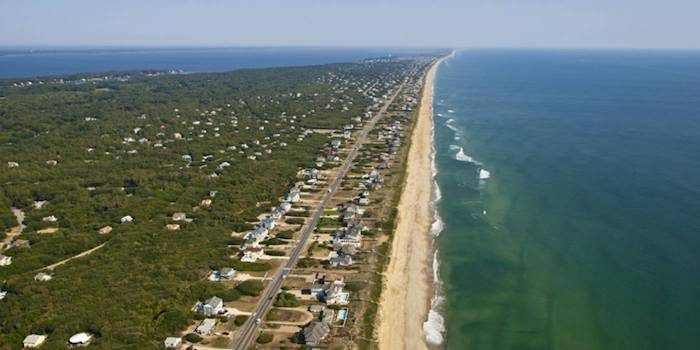 Located just south of Duck and north of Kitty Hawk, the town of Southern Shores offers some of the better running options in the Outer Banks. It’s one of the wider spots in the Outer Banks and features some of the area’s nicest homes, with quiet, canopied residential side streets good for running. A multi-use path runs along the Highway 12, with ocean views in parts. On the west side, there are some good, longer roads along the golf course that are pleasant for running. Note: this is mainly a residential community, so there might be parking and beach access challenges. N. Dogwood/S. Dogwood. For an easy, flat, traffic-free run, use N. Dogwood/S. Dogwood Trail (it’s a road, not a trail), which goes north-south for 3.25 miles. The road is fairly quiet but there’s also a multi-use path along most of it. S. Dogwood skirts the Duck Woods Country Club. Nice canopy, so a good shade option on a hot day. Ends at the Rt. 158 Bridge, where it’s possible to continue out to Martins Point. Residential Streets. There are plenty of residential side streets in Southern Shores that are good for running. Starting at the Outer Banks Visitor Center, head north and wind your way in and out of these curvy streets, using Highway 12 as a focal point. Not hugely interesting, but decent road running (and some hills). Highway 12. A multi-use path runs alongside the highway in this area. There are ocean views at some points, though there are homes along the water. Beach. The beach in southern shores is wonderful, and can be great for running in the right conditions. Note: Public beach access might be a challenge.